Mixed Vegetable Manchurian, as I mentioned in my last post, is yet another dish from Indo Chinese cuisine. 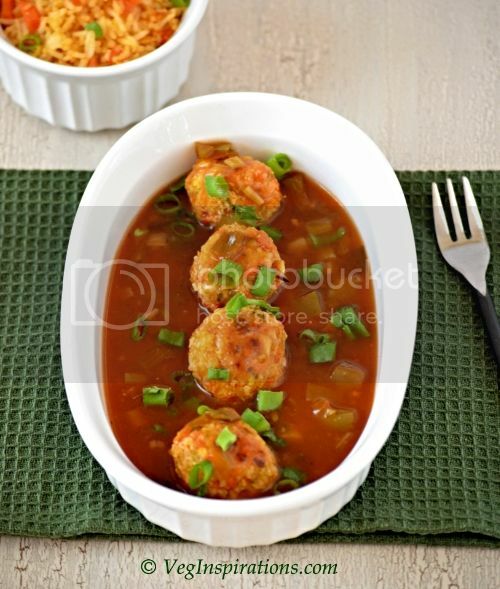 It is made with fried dumplings in a soy sauce based gravy and is popularly paired with Vegetable fried rice. 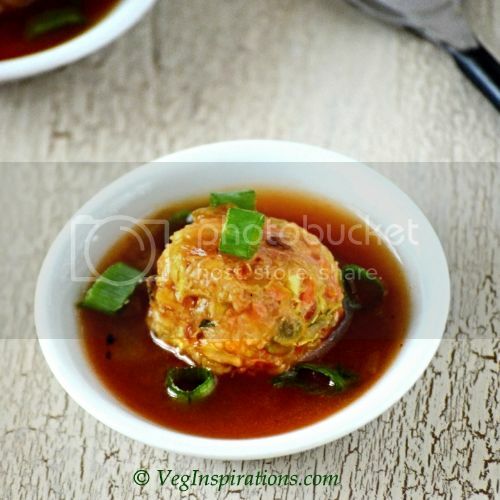 There are some dry variations made with Manchurian that are served as an appetizer. I have never tried my hand at them, simply because the version gravy appeals to us a little more. Pre heat oven to 350 deg F (180 deg C) . Line a tray or cookie sheet with aluminum foil or parchment paper and keep aside. In a large bowl, add the shredded cabbage, carrots, cooked rice, minced ginger , green chilies, salt and mix well. Add corn starch and all purpose flour, one tbsp at a time and keep kneading the mixture until it comes together and you are able to shape it into small lime sized balls. Arrange these about 1/2 an inch apart on the tray/ cookie sheet. Brush it on with oil and place in the oven and bake for 30-40 minutes or until evenly golden, turning once in between for it to bake evenly. Edited to add : Subsequently when I made these manchurians, I baked @ 400 deg F for 30 to 40 mins and broiled for a couple of mins to get a more golden brown color. I liked the way it turned out then too. The updated picture I have added now is from the time I baked @ 400 deg F and broiled. Grind ginger and green chilies in a spice grinder with a little water into a smooth paste. Heat oil in a large heavy bottomed pan and add bell peppers. If using spring onions, add spring onions and bell pepper together and stir until it cooks, then add garlic, stir for a few seconds. Then add ginger green chili paste and stir a couple of minutes. Add soy sauce, red chili sauce, ketchup and mix well. Add water as required, add salt to taste, then allow the mixture to come to a boil. To save time, you can use 1-2 tsp of ginger garlic paste as per taste. If you do, just finely cut the green chilies and add to the oil along with the spring onions and bell pepper, after it is tender crisp add ginger garlic paste, then continue with the rest of the recipe. For the manchurian you can also add some cauliflower florets along with cabbage and carrots, make sure the cauliflower is cut very fine, I would recommend using the food processor for the cauliflower as well. Baking times will vary depending on the size of the dumplings.I kept the dumpling an additional ten minutes or so just to make it crisper, in case you want it just golden brown, you can remove it earlier. I usually use Chings brand red chili sauce.